Sweet Life Home Hotel is a 19-bedroom luxury boutique hotel uniquely located right in the heart of the fastest business developing corporate hub of Lekki axis. A home away from home, an haven of comfort, hospitality and luxury, strategically located 2 Kilometers (5 min drive) from the headquarters of major oil & gas corporate offices. This establishment is located at 2 Ivory Street, Off First Avenue, Behind AA Rescue, Jakande Roundabout, Lekki, Lagos, Nigeria. Sweet Life Homes offers distinct deluxe rooms ranging from Gold Rooms and Platinum Suite. Sweet Life Home Hotel offers impeccable personalized service standards tailored to the discerning traveller, who values comfort, style and consistency in service. 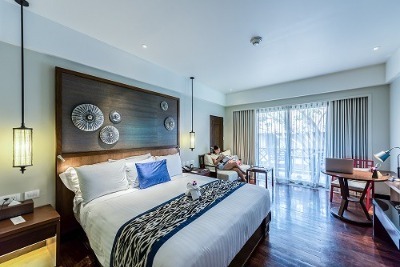 All our rooms are uniquely designed for relaxation and entertainment within a serene environment. All guest room amenities and features includes 24-hour room service, Air conditioning, En-suite Bathroom, Complimentary high speed wireless internet access, Mini Bar, Flat screen TV with satellite cable service, Complimentary bottle of mineral and water, Tea/Coffee making facilities, DVD Electronic system. Children: All children are allowed. Q: Does Sweet Life Home offer free wifi? Q: Does Sweet Life Home have a swimming pool? Q: Does Sweet Life Home offer complimentary breakfast? Q: Is there a fitness centre/gym at Sweet Life Home? what type of equipment are available? A: Yes. Modern facilities are available. Q: Does Sweet Life Home have a restaurant? A: A restaurant is available Sweet Life Home. Q: Does Sweet Life Homes offer free parking? A: Yes, free parking is available. Sweet Life Home is a budget hotel in Lekki, Lagos. I was very happy that we decided to stay here. The room was neat and well arranged with good food and a well-behaved staff. Power and water supply was constant. The environment had an unmatchable ambience, very serene and secured. Thank you for a good stay. Have nice pictures of Sweet Life Home?